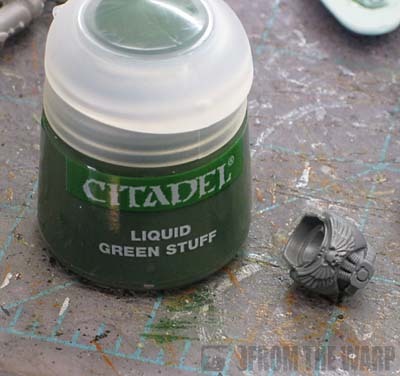 I know, liquid greenstuff has been out for a while now and I just got my hands on a pot of the stuff. I thought I might pass along my thoughts on it for those who still haven't picked some up yet themselves. Nothing like a timely review. Setting aside an old paintbrush seemed to be a no brainer for this one. Not knowing exactly how it was going to work meant I didn't want to scrap a perfectly good brush using this stuff. The other thing I figured would be handy would be a handful of Q-Tips for cleaning up the excess greenstuff off the surface of the model. Where does it shine and where does it fall short? This stuff is great for smaller and I mean smaller gaps or surface imperfections on models. You still need to take some time putting your models together cleanly. This stuff is not magic and it's not going to erase everything because you threw your model together real fast. The stuff goes on easy enough. A quick dip into it and you paint it onto the joint/imperfection in question. You have to move quick as the stuff dries fairly fast and gets glue-like in its consistency almost immediately after coming out of the pot. I'd say it dries quick too, but I don't know for sure since I have a habit of giving greenstuff plenty of time to dry already. It doesn't work in larger gaps. You can add a few layers of it giving each one plenty of time to dry, but you'd be better off using actual greenstuff to fill in larger imperfections or misalignments. If you've got something on a surface that is minor, then this is the stuff to use. When it comes to cleaning up, the damp Q-Tip is perfect. You can apply as much pressure as needed to remove the excess material. Where have I used it to consider myself an "expert?" A couple of places. The first place was on the collar of a Space marine I was building. It would have been far better to use real greenstuff to fill the gap despite having trimmed it down a little bit beforehand. The second place was on the surface of my Eldar Corsair conversion wing assembly. It kinda worked, but I could have done it by shaving away the excess surface texture just as well and using paint to fill in the irregularities. On a Necron warrior shoulder. The gap was way too big and despite numerous passes to try and build up the material, it just would not fill the gap. Another place I should have used real greenstuff. Even on my current Dark Angels FW dreadnought, I skipped the liquid stuff all together in favor of the real stuff. And I had seven places that needed "fixing." Short answer, if you're looking to get visual perfection from your model, you painstakingly clean all your mold lines already, apply your model glue with great care and delicately fill gaps where needed, then this stuff will make a nice addition to your arsenal. It's there to help with the smaller problems and keep you moving at speed. If the occasional mold line doesn't bother you and a little excess glue isn't an issue, then save your money for something better you'll put to use. By getting this stuff, you may end up trying to force yourself to use it instead of a more appropriate method and you'll find yourself disappointed and wasting your time more than anything else. UPDATE: It's been almost a year since I've bought this stuff and I think I can count on one hand the number of times I've used it. I find the regular greenstuff works so much better for filling small imperfections. Maybe that's because I'm used to working with the regular stuff. Ron, you might want to have a quick glance here: Pirate Viking Painting as I've used a few tricks (mostly watered down LGS and so on) that will add to your experiance. what i was interested in is how useful this stuff might be for guys like me who scratch-build a lot with plasticard. i often get gaps on the corners or between joins which i have to fill with putty or green stuff. conventional green stuff is a hastle when there are only a few extremely tiny gaps on an entire model, so i think i'll give this a go based on your feedback. Pirate Viking: Thanks for the link. Atreides: Absolutely. A few extremely tiny gaps left over because you couldn't get a "perfect" fit even though it's super close due to your craftsmanship is where this stuff shines. Otherwise, continue to do your best with your conversion work and use the regular stuff. I had no idea this stuff existed. Not a clue. Given the staff in my local GW tend to draw new things to my attention whenever I go in and we usually discuss whatever model I'm converting at present, I'm surprised they've never mentioned this. Thanks for the review Ron. I like to use Liquid GS for smoothing pits and filling details. For example, I built an Ultramarine Honour Guard model using a kitbash of plastics. One of the pieces I used was a set of Grey Knights legs, with the carved lettering. Two thick applications of Liquid GS filled the lettering perfectly. For me, the trick was really blobbing it on. The stuff shrinks when it dries. After the first pass, I sanded the area down smooth. Applied another coat once the surface was cleaned (but some small pits remained in the deepest areas). Repeat the overnight cure and sanding, and I had a perfectly smooth leg plate! As you mentioned, I'd never use it for wide gaps or hard edges. You'd be better off with Brown Stuff for hard edges or regular GS for large gaps. But after those are applied and cured, you can use the liquid to provide a seamless transition from putty to plastic by using a superfine grit sandpaper. I agree with TheRhino. I use it to fill in small gaps and cracks. You do have to thin it a bit to make sure it doesn't dry out on you right away, but as you said Ron, it is an excellent item to do the job it is meant to do. It's not a replacement. The bottle lasts a long time, though. 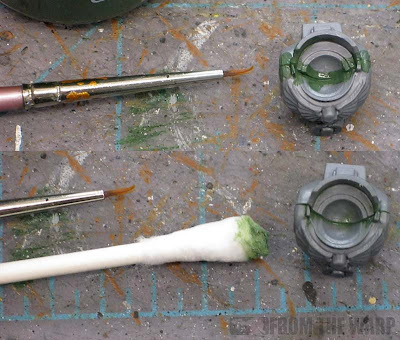 I had some success in using it in smoothing out a bad Basecoat i did on a Landraider. I'd put the basecoat down way too thickly on the front of the model and needed to sand some away and then reapply. Afterwards there was a distinct difference between the two layers of paint. I used this stuff to blend the two together and sanded it after it dried again. The final effect was hardly noticable. I tend to use Milliput thinned with water (the standard Yellow-Grey) for this, it is cheaper and you can do bases for scultping over with it. Well you can sculpt with it too but it can be a bit brittle on really fine things unless you carefully make moulds and resin casts of your sculpt. Dezartfox: And that's the thing, it works for the smallest of problems only. Sendraks: Yikes! I thought everyone knew about this stuff with the blow-up about Finecast quality. TheRhino: aAnd there's my problem with the stuff. Sure, it shrinks a bit and you may need multiple coats, but after that I have to sand it to get it smooth! I'll use regular gs already, smooth it in place in one pass and move on. Snake88: Now there's a good idea... filling in surface imperfections in paint. But again, this stuff should shine in this dept since it's designed for the smaller issues that come up. That's taking your modeling and painting up a notch when you're filling in those kinds of imperfections. Da_Sub: I've just started using milliput for making things. I never thought about thinning it to fill in gaps. I might have to try that little trick. I think the reason none of us have heard about this is because this product became nessessary as a way fix the bad finecast sculpts. Will: Good point. For me, it all keeps going back to the super-fine attention to detail. If you need it on a model (for display purposes say) than this stuff may help. Otherwise, I'm going to pass. Very interesting article, seems like a rather niche product specifically designed to counteract some of the technical shortcomings on the Finecast product range. To be honest, beyond scratchbuilding and scultping I do not see much use for this product for the regular wargamer. I can potentially see it being used as a smoothening agent for beginning sculpters (The Pirate Viking's post mentioned above does demonstrated some rather smooth effects. ). Hephesto: I do believe you've hit the nail on the head Sir.